We've visited the Yolo Causeway several times before because it crosses over the main flood protection for Sacramento (Yolo Bypass) and because it has an interesting seismic retrofit (pile wraps at lap splices for liquefaction) but we are revisiting it today because it is home to 300,000 bats. Every evening at around 8 PM the bats drop out of their resting place (between the precast girder segments), fly around a big oak tree (on the left), and spend the night flying many miles in search of insects. The Mexican Free-Tailed Bat is a remarkably evolved creature. It flies from sunset to sunrise and catches its weight in insects (using its wings and a catcher's mitt of a tail to funnel them in). The male sings to win a mate, the female has one child a year, and they emit a high pitched series of sounds to locate their prey. Bats love bridges but bridge inspectors don't love bats. Their excretions are the source of the debilitating Hantavirus. However, California State environmental planners require any bats removed from a bridge to be given a new home near their preferred habitat. 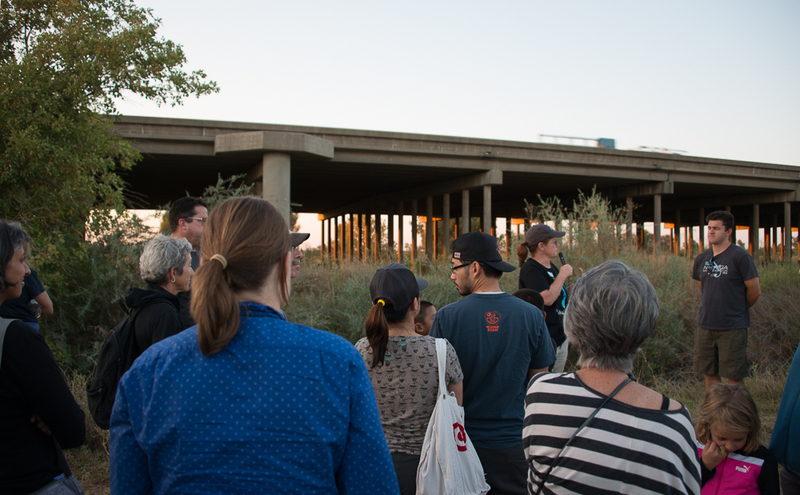 In the photo below a zoologist is taking visitors on a tour of Yolo Causeway (at sunset) to witness the daily exodus of the bats.